A long time ago in a galaxy far, far away (well, actually near Munich, Germany) began a story that paved the way for a rather special project: ScienceAtHome. And this is the story we want to share with you today. To be precise, everything began 8 years ago when Jacob was doing his post-doctoral work at the Max Planck Institute in Garching, in professors Immanuel Bloch and Stefan Kuhr’s group. However, little did he know that this was the starting point of a great adventure. First things first, let’s quickly present Jacob: besides being the brain and soul behind ScienceAtHome, he is also an associate professor at the department of Physics and Astronomy of Aarhus University. So, back in Garching, Jacob worked along with a team of extremely talented quantum scientists on setting up a completely new type of experiment. Their goal was to develop a new high-resolution imaging system. 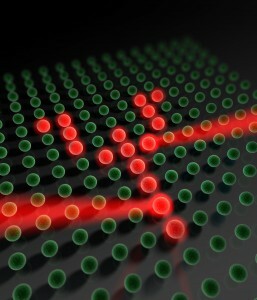 A system that would allow them to image one single atom, something that was thought impossible some years back. Indeed, atoms tend to stick together and form bonds. 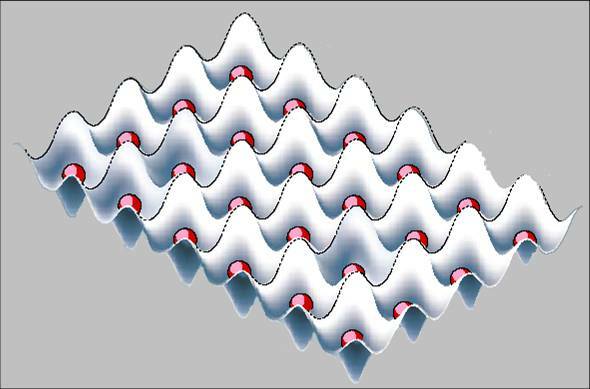 After four years of hard work, they first created an optical lattice (an egg tray like container) where they managed to trap single atoms into each well. Then, they imaged these extremely cold atoms (only a few nanokelvin-that’s a billion times colder than a kelvin!). Jacob’s team and an independent team in Harvard were the first in the world to achieve this entire imaging process. An optical lattice definitely looks like an egg carton. Image credits: I.Bloch, MPQ. 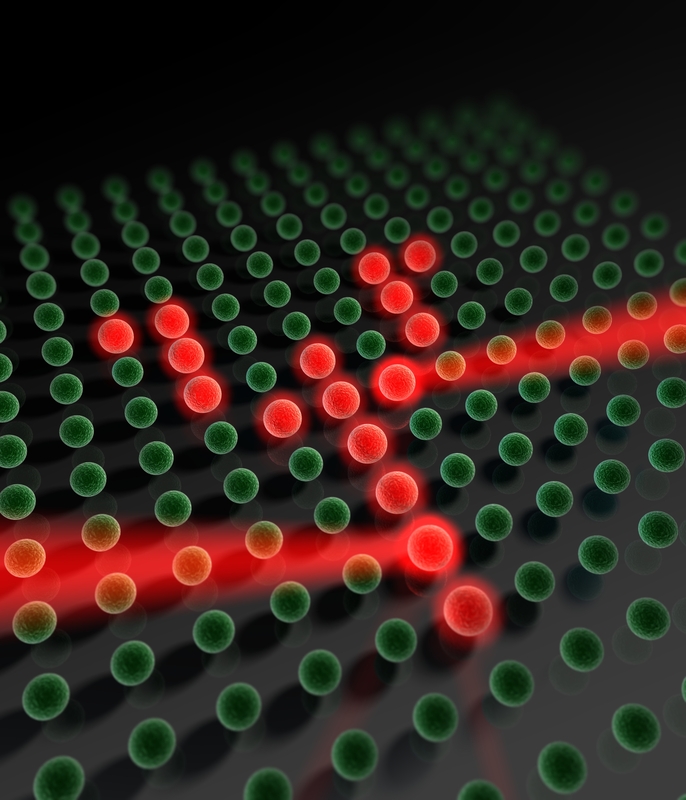 Furthermore, Jacob and his team were the very first in the field to focus a laser beam onto a single atom and flip it from a glowing to a non-glowing state. This meant that they would be able to take advantage of a wonderful fact: an atom, being at the same time in the 0 and in the 1 state, could give good premises to build a so-called quantum computer. The idea of creating a quantum computer, even a small one, was just amazing. A quantum computer will undeniably have more computational power than all the conventional ones in the world. 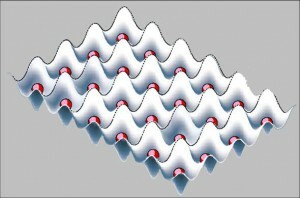 When Jacob returned to Aarhus University in 2010, he began contemplating the problem of converting this rough proof-of-principle experiment into a fully functional quantum computer. With a couple of colleagues, he showed that theoretically, this would be possible. And here was how: first, pick up a single atom with a focused light tweezer (picture below), move it around, and finally, deliver it to another well in the lattice. Of course, the movement had to be without any sloshing of the atom. For this, imagine yourself having to quickly move a bowl full of water from one point to another. Jacob and his colleagues set up the theoretical framework to be able to simulate the effect on the atom when moving it around. After that, they let a (non-quantum…) computer algorithm try out multitudes of possible paths from A to B, always trying to minimize the sloshing in the end. To their disappointment, it did not succeed. The computer-generated paths were not as good as they had hoped for and the dream of building a quantum computer seemed unachievable. A focused light tweezer. Image credits: I.Bloch, MPQ. And this is where Scienceathome.org entered the game. If you are curious about what happened next, read the part 2 here.